With a 999 on the floor as a demo bike, it follows that it would be fitted with some sort of muffler kit. The 999's are a bit different from the previous 996, even 998 models in that the design is way different to the previous. So, we had to wait a little while for things to start appearing. Heres a photo of the fitted muffler. The muffler is very similar in external construction to the std unit, although the ends are riveted on. Internally, it is just two straight through perforated tubes, which change from round at the inlet to oval at the outlet. One thing that is different, however, is that there is no "collector" between the two pipes, and therefore, cylinders. This is unusual to say the least, and due to the design of the system. Both pipes come into the muffler separately, and run through without any joins. Whether this is a good or bad design depends mainly on which school of exhaust design you belong to, or if you even care. If it really upsets you, you can buy one of the other kits available, but more on that later. You could always make your own system, but anyone with exhaust making experience knows how much fun that can not be. One thing that I believe this un-collected design leads to is the note the exhaust makes. Compared to the 996-type noise, its a noticeably different note that to my ears reminds of a "hotted up" Subaru WRX, with its throaty, flat four sound. Not sure why, but thats how I heard it. Its certainly not overly loud, but has the usual Ducati depth, and should satisfy those in need of more noise from their bike. After the kit had been fitted  a job which takes a few hours given the amount of disassembly required to remove old/fit new bits, I decided to take the bike home for the night. Given I hadnt ridden a 999 before (due to the hopefully last leg operation) I had no "std" feel for the bike. Anyway, after not having ridden for 6 months, getting onto something like this straightaway was probably not a good idea. The 15-minute ride home resulted in a rather unpleasant encounter with the law, leaving me very lucky to still be in possession of a licence. I was riding like a git. The bike is amazingly deceptive to what speed it is doing, and it accelerates very fast, even on a top gear roll on. With the close ratio gearbox the 999 runs, 6th is the same as the old 5th. Which goes someway to explaining why the top gear roll on is so quick. I wasnt really looking at the rather hard to miss speedo on the new dash as I made my way through the freeway traffic, but when I did I was shocked on two grounds. One being how fast it had got there, the second that there was no sensation, or even wind noise, to let me know how fast I was going. Compared to Minnie (the fairing-less 600M), and even the 888, there was no wind noise or buffeting at all, so I just rode along thinking I was going a bit faster than all the cars. Hmmmmmmm. Not the smartest thing Id done. I got booked for rolling the throttle open to get around some cars and to my off-ramp, and was amazed when told of just how fast I was allegedly going. Of course, it took a bit of chasing for him to get me, only because I couldnt see anything in the mirrors. It must look pretty funny to see a police car driving along behind a motorbike  lights flashing, etc  with both travelling at the 60 km/h speed limit. I just had no idea he was there. Apart from that, I was quite enjoying the ride. More comfortable for me than the model it replaces, I was rather happy on the bike. I do like the way they look too, although Im pretty much used to them already. Surprising how the newest thing becomes the norm so quickly, and just how old and dirty those bronze framed 916s look now. But, I have been looking at them pretty much every day since late 1994. Anyway, to the graph. The bit everyone wants to see. Before is green, after is red. The power increase is not very big, but 118 Hp from a std muffler 998cc twin is pretty flash, as is std muffler design these days. The improvement in the mid range is more what I expect these days, as restrictive mufflers seem to limit lower RPM operation more than high RPM, for some reason. The thing you dont see, and the thing I usually mention, is the change in how the bike feels. I didnt ride this bike before the exhaust kit went on, so I had no feel for a std 999. However, others have commented on a big difference in response and all round go. It certainly is a pretty impressive engine, powerful, flexible and very nice to use. Now, some more info on the various kits available. The reason a new horizontal cylinder header pipe only is supplied with this kit is that the std header pipe from that cylinder has a catalytic converter fitted, just about where the pipe increases its diameter from 45 to 50mm. The new pipe has no cat converter, and is therefore unrestricted. This probably has as much to do with buyer perception as need to remove the cat for "off road use". The cat converter for the vertical cylinder is in the std muffler, not the header pipe, so that header pipe is kept. As seems to be the case for many manufacturers, the release of a new model has not been accompanied by the release of the complete accessories catalogue. Youd think it wouldnt be that hard to organise, really. So, people have been ordering mufflers for their new bikes, and now that the full range of kits has been released, there are a few more options available than was first envisaged. This mainly has to do with "oversized" kits  ie, going up to 50, 54 or 57mm header diameter. There are kits supplying 50mm systems (including both header pipes) in the std style, and also kits consisting of a 212 system. This is a bit more like the old 996 system in style, and the same as the ones the Ducati/Fila race team run. These kits have a header pipe for the vertical cylinder that comes down behind the engine, joining with the horizontal header at the bottom rear of the engine. A single collector pipe then comes back up, in the same position as the std horizontal cylinder pipe, to split again into two pipes up under the seat that then go into the muffler. Im not sure how these actually fit, as I havent seen one yet, and it was impossible to see on the race bikes as they whizzed past coming out of MG corner. They are, however, obviously the "hot" set up. And rather expensive. 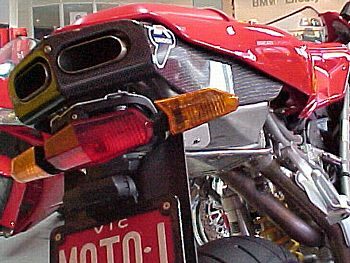 Most people who have raced 998S say that a big exhaust is the first step for real power, and, as the 999S come std with the Strada sized 45mm header pipes, so if you are serious about your Hp, a big system will be a automatic requirement. No doubt the 749/999 forums will be full of cheap ways to get a little noise without spending the Ducati Performance bucks. I see that Silmotor have already got their muffler on the market. Well, at least pictures on the net (the most important step?). If you are curious or interested in more info on any of this stuff, I suggest you speak to your spare parts man for the full run down. I have been told a 999S with the 57mm 2-1-2 kit is good for around 150 Hp, but I havent seen any proof of that yet.